Warner wins 2007 Barbados Championship! 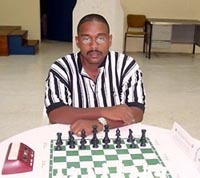 FM Delisle Warner (pictured right) is the 2007 Barbados Champion after defeating Martyn Del Castilho in a tiebreak match. Both players were even after eleven rounds on 9-2 and engaged in a playoff rapid match. When those two games were split, they went to a blitz tiebreak which Warner won. FM Philip Corbin took 3rd place on 8½-2½ while FM Terry Farley, who has recently eclipsed 2300, was fourth on 8-3. The defending champion was upset in the last round by Del Castilho and aborted a successful title defense.